A natural connector and leader, who is passionate about making a difference in people’s lives. Sam develops trusting relationships that derive tangible benefits for all stakeholders. With an eye for technologies of the future, a diverse multi-lingual & cultural background, extensive experience across disciplines, industries, and geographies; He is able to drive organizational changes that deliver business growth and success. Sam is an industry veteran with almost three decades in the IT sector at companies such as Intel and American Express, in the fields of Engineering, Sales & Marketing; and on the ground experience in Asia, the Middle East, Africa, Europe and The United States. Sam is the Founder and CEO of Smart Solutions International, a Singapore based company that applies leading edge ICT solutions to smart cities, smart homes/offices & smart education. He is the Technology & Innovation Partner at Treasure Capital Asia, and advises multinational companies such as Silver Spring Networks. He is also on the board of several companies in Asia & the Middle East including e-Home Automation, Ecosoftt, Extramarks & NetSpec Global. 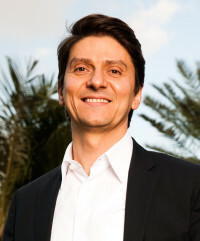 Prior to his entrepreneurship career, Sam spent 26 years in engineering and management positions with Intel in the Silicon Valley, Germany, the UAE and Singapore. In 2013 he became the Regional Education Sector Director for Intel in Asia Pacific & Japan, based in Singapore, where he and his team were chartered to establish Intel’s education business and work with the ecosystem across Asia to deliver world class solutions addressing the educational sector’s technology needs - this is a business unit that he set up in the region that he grew to deliver over half a billion dollars in 2015.